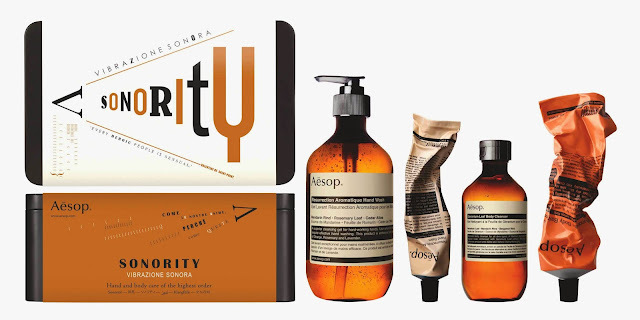 It’s always fascinating to encounter a skincare brand that puts a great deal of importance on antioxidants. Being acquainted with the amazing science of how antioxidants directly affect the health of our skin in my brand management experience, I award respect and value to products with antioxidant properties. Aesop, properly written as Aēsop (but for easier typing and for search engine purposes, I’ll stick to normal alphabet), has products ranging from skincare, body care, hair care, fragrance, gift sets to home products. 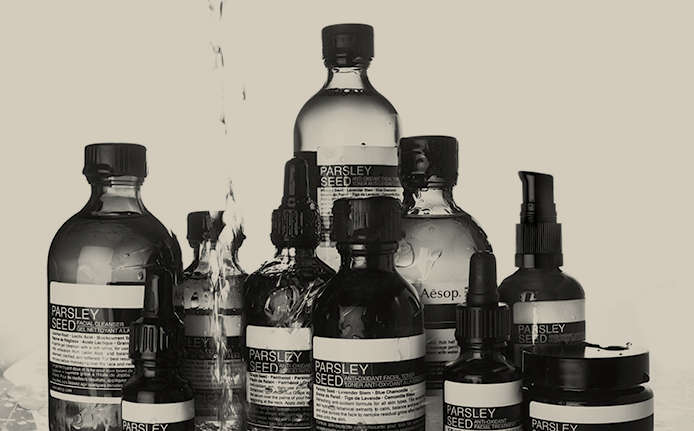 When I first visited an Aesop counter last year, what captivated me the most was the Parsley Seed Anti-Oxidant Facial Toner. It’s a toner that soothes, balances and evens the appearance of the skin without causing dryness or damage, and prepares it for hydration. I find it interesting due to the parsley seed main ingredient, which is known for stimulation of production of collagen. It also contains high amounts of Vitamin C, which may nourish the skin to reduce fine lines, scars, blemishes, and even reduce pore size. PORE SIZE. But this is the season of giving! For this holiday season, Aesop has launched 6 amazing collections in combinations of skin care & body care, including a set made for men, too! 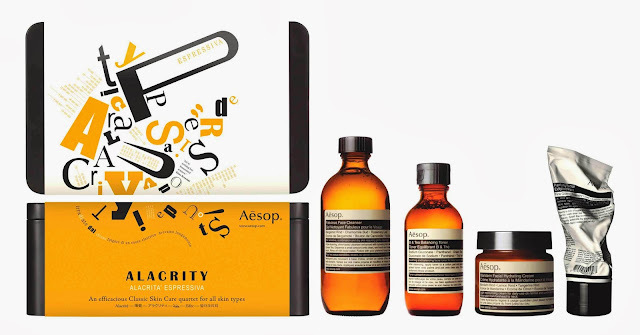 Aesop’s fascination with the arts has this year inspired a series of seasonal gift kits focused on the Italian Futurist movement of the early twentieth century. Initiated by F.T. Marinetti in 1909, the movement spurned tradition and passionately embraced the technological innovations of the machine age. It spanned the fields of architecture, painting, sculpture, design, literature, theatre, music and food, aiming to modernize Italian culture comprehensively; and it contributed significantly to the evolution of modern art. 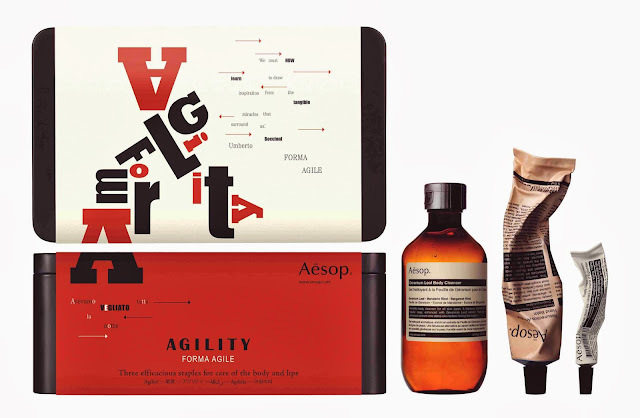 In referencing the Futurists, Aesop celebrates their rebelliousness, inventiveness, and unabashed eccentricity. 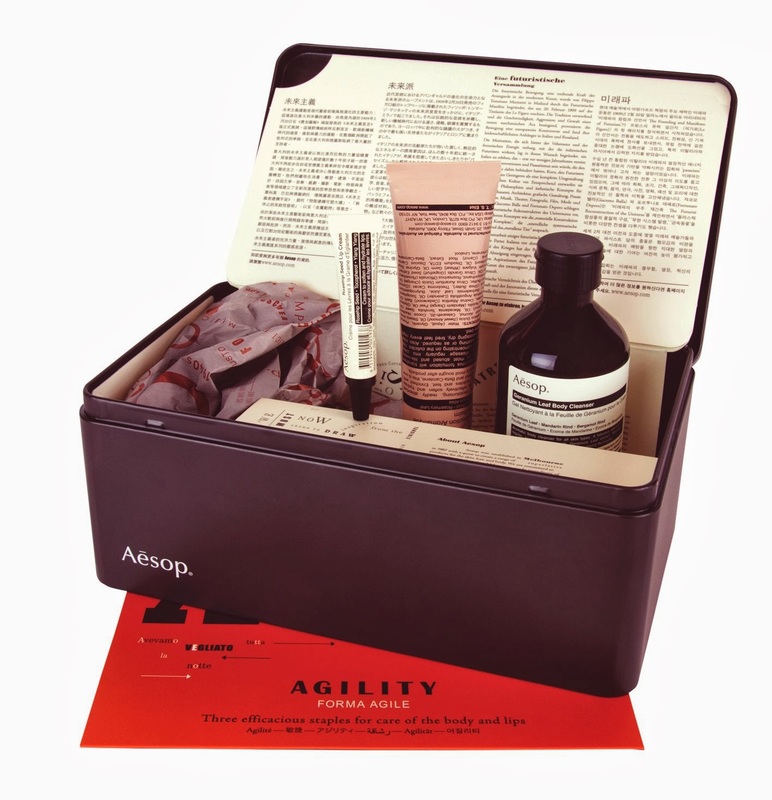 The six gift kits are presented in sleek, elegant tin boxes, featuring titles and designs that pay homage to groundbreaking Futurist language, art and typography. The contents vary from a convenient set of men’s grooming essentials to a comprehensive hand and body care ensemble, to a trio of full-sized products from Aesop’s anti-oxidant Parsley Seed Skin Care range. An artfully constructed brochure that folds in various configurations accommodates and protects each product, and provides summary details on the movement and its guiding proponents. 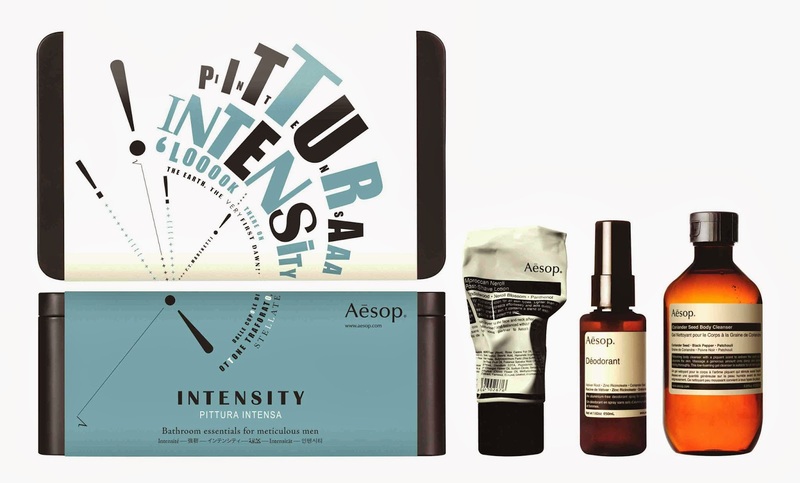 A Futurist Assembly is available at all Aesop signature stores and counters in fine department stores across the globe. Agility is named for the dynamic forms of Futurist sculpture. 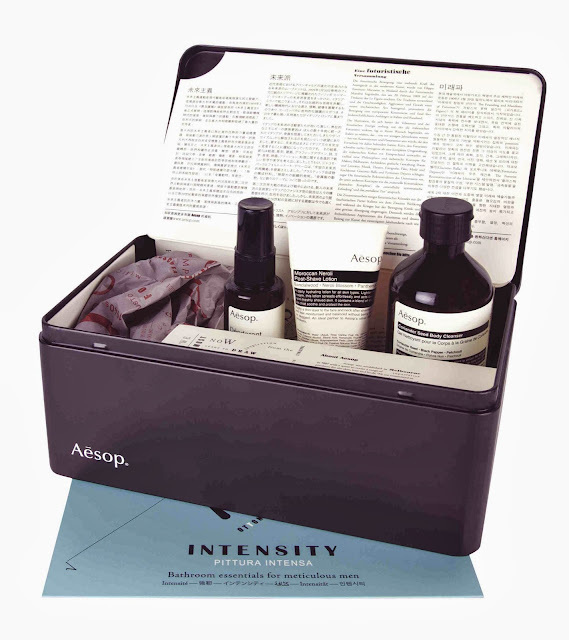 It presents a trio of products especially suited to use when travelling as well as everyday grooming – low-foaming Geranium Leaf Body Cleanser for gentle, thorough cleansing; Resurrection Aromatique Hand Balm to provide readily absorbed moisture for the hands and cuticles; and Rosehip Seed Lip Cream to hydrate and nourish the lips. Alacrity is intended as a tribute to the innovations of Futurist theatre. 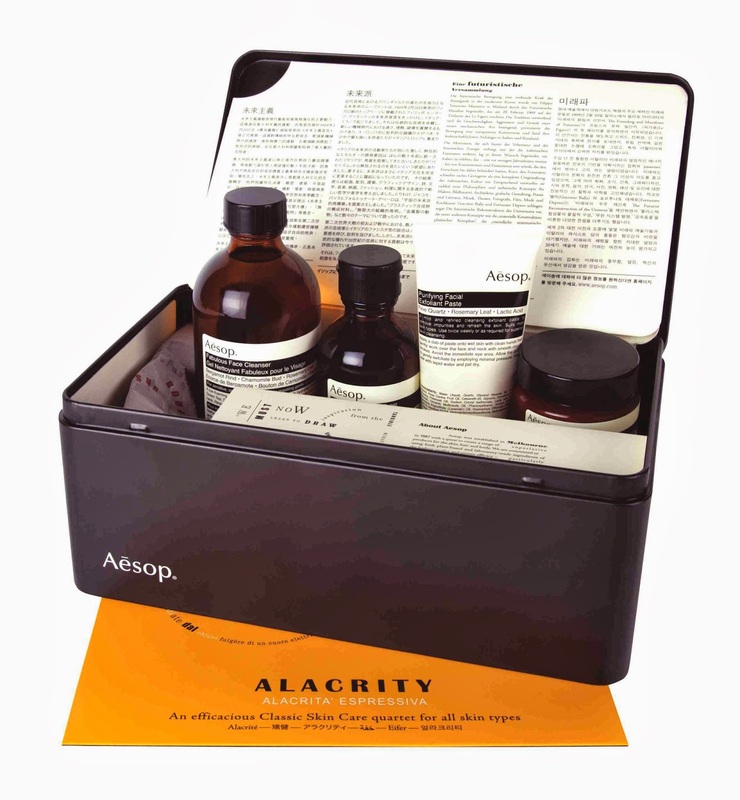 It offers four highly compatible products from Aesop’s Classic Skin Care range – Fabulous Face Cleanser to remove grime and makeup thoroughly without drying the skin, Purifying Facial Exfoliant Paste for deep cleansing and mild exfoliation that leaves the skin meticulously clean and smooth, B & T Balancing Toner to soothe and balance, and Mandarin Facial Hydrating Cream to hydrate and soften the skin without leaving shine or residue. Sonority celebrates the idiosyncrasies of Futurist music. 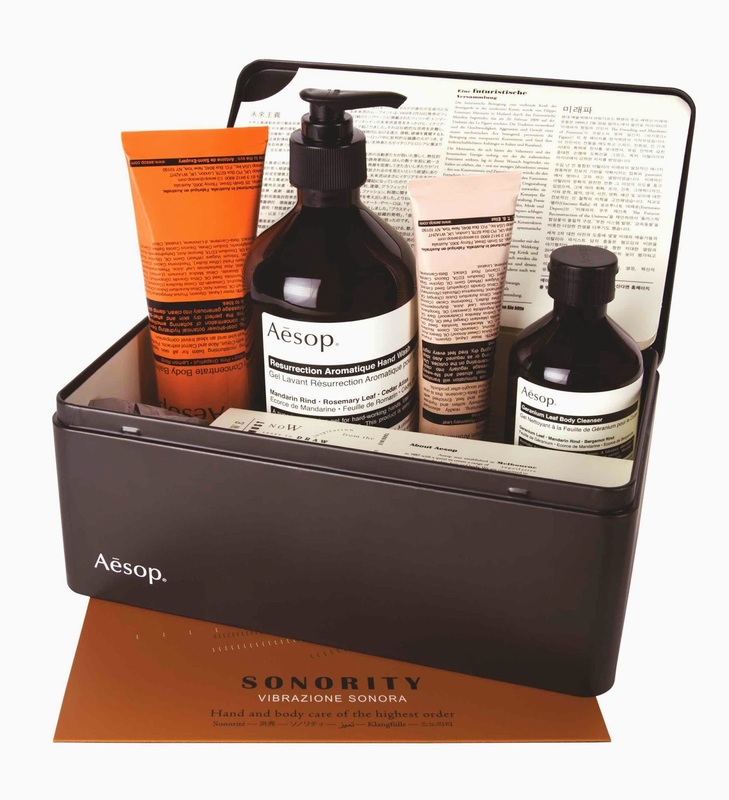 This quartet of much-loved Aesop products is formulated especially to nurture the hands and body. Resurrection Aromatique Hand Wash gently cleanses without drying the skin, and fragrant Resurrection Aromatique Hand Balm helps maintain soft, hydrated hands throughout the day; in bath or shower, mild, low-foaming Geranium Leaf Body Cleanser removes impurities and refreshes the skin, while Rind Concentrate Body Balm refreshes, nourishes and moisturizes. Intensity is inspired by the vibrant paintings of the movement. Created with the active gentleman in mind, it offers a trio of formulations ideal for post-workout purification – Moroccan Neroli Post- Shave Lotion to soothe, nourish and moisturise; Déodorant to neutralise underarm odour and provide an appealing Vetiver scent; and low-foaming, invigorating Coriander Seed Body Cleanser to cleanse and refresh the skin. Potency pays respects to the Futurists’ ideas on architecture. 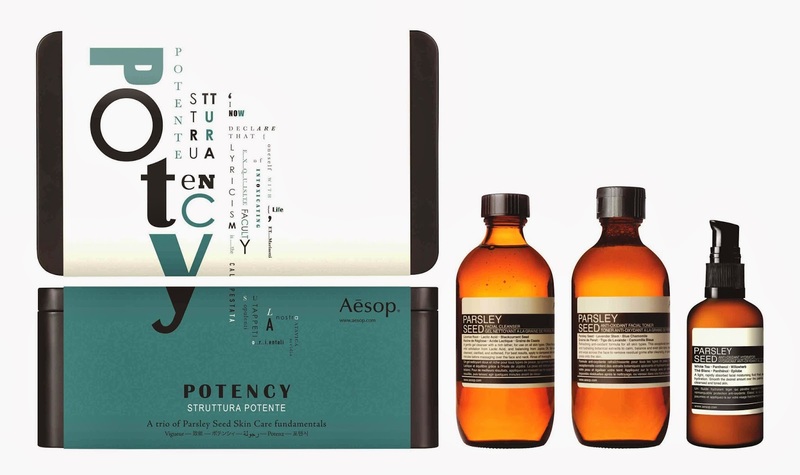 Its structured offer comprises three products from Aesop’s Parsley Seed Skin Care range; each product contains Parsley Seed extract, an ingredient rich in anti-oxidants that help protect the skin against cell damage caused by environmental and internal factors. 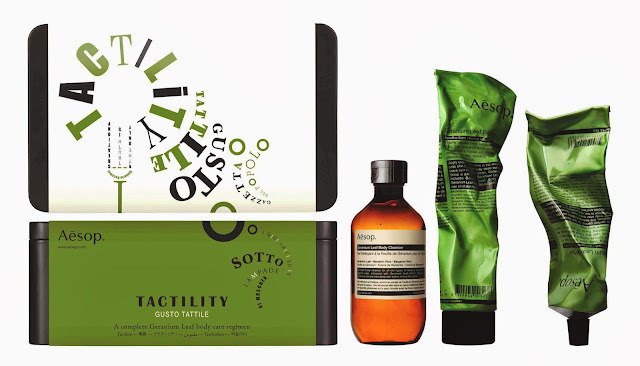 The trio includes gel-based Parsley Seed Facial Cleanser, which gently removes surface impurities and offers mild chemical exfoliation to smooth the skin, Parsley Seed Anti-Oxidant Facial Toner to soothe and balance, and rich yet lightweight Parsley Seed Anti-Oxidant Hydrator to soften, hydrate and fortify the skin. Tactility pays homage to the innovations of Futurist gastronomy. It offers a nurturing trio of Geranium Leaf body care staples – refreshing Geranium Leaf Body Cleanser for gentle, thorough cleansing, Geranium Leaf Body Scrub for aromatic exfoliation, and Geranium Leaf Body Balm to hydrate and nourish the skin. 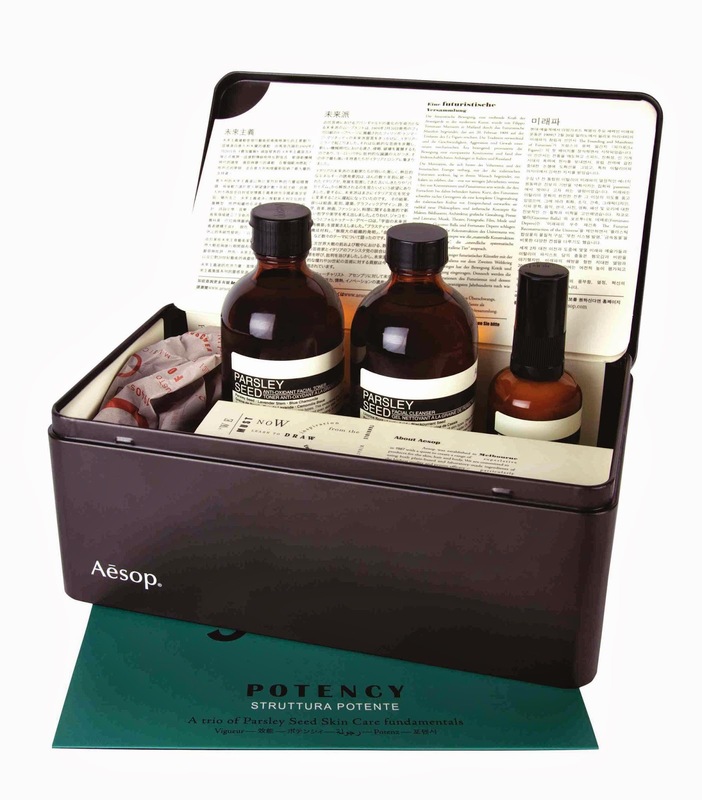 Aesop values all human endeavors undertaken with intellectual rigor, vision, and a nod to the whimsical. Every Aesop product is made with the same attention to detail we believe should be applied to life at large, taking into consideration a diversity of needs as well as seasonal and environmental conditions. We advocate the use of our formulations as part of a balanced life that includes a healthy diet, sensible exercise, a moderate intake of red wine, and a regular dose of stimulating literature. TAKE NOTE: “a moderate intake of red wine”! Now, that’s my kind of balanced life concept!